Wheatpaste Art in Downtown Bangor Gets "Abominable"
First there were pigeons, then there were unicorns, and now there's the Abominable Snowmonster. On State Street, in a spot the City has targeted as a possible mural site, "Snowzilla" reared its head out of a hole. 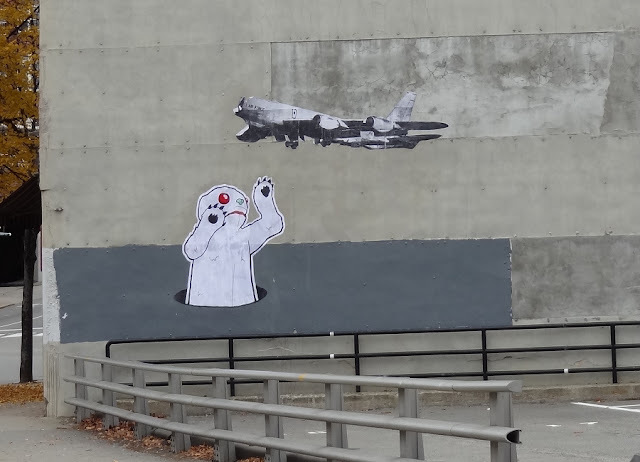 In a King-Kong-like pose, the red-eyed beast appears to be fending off attacks from an airplane wheatpasted by the street artist named Pigeon. The Frankenstein's Monstorm looked like it was doing a number on it, so I thought I'd get my own (horribly lit) shot of it before it came down.